Developed, in part, for college programs associated with the Gulf Coast Process Technology Alliance, these Process Instrumentation textbooks focus on the study of the instruments and instrument systems used in chemical processing, pulp and paper, oil refineries, food processing, and related industries. This textbook takes an applied workplace approach covering everything from a basic introduction to process control to measurements and control valves. Does your curriculum require additional topics not included in this textbook? 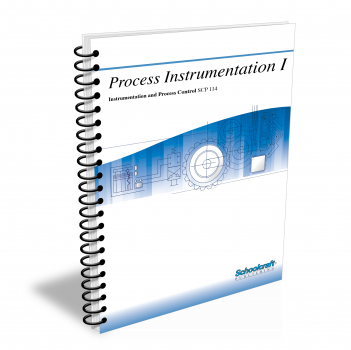 Build a customized version of the Process Instrumentation I textbook below. Explain how measurement and control are related in industrial processes. Describe the four essential functions of an automatic control system. Discuss the functions of the CRT and PLC in control systems. Identify variables in industrial processes. Explain the importance of feedback in a closed-loop control system. Discuss the differences between modern automatic control systems and older ones. Identify the standard signals used in process control. Define the terms commonly used in control terminology. Explain the differences between open-loop control and closed-loop control. Describe on-off, proportional, integral, derivative, and PID controller action. Discuss standard signals and linearity and explain how to calculate the value of a variable from an instrument's span and range. Describe five common sources of error in signal measurement. Discuss the basic principles governing pneumatic signal transmission and explain how a flapper-nozzle device works. Describe the function of the controller in a control loop. Discuss the basic principles governing electrical signal transmission, including Ohm's law, and list standard current and voltage signals. Explain the function of I/P devices in a typical control system and discuss the use of digital signals and optical signals. Explain why measurement is necessary and discuss conditions that affect the degree of accuracy required. Compare the advantages of linear and nonlinear displays. Compare analog and digital devices and explain how each is applied to measurement. Name five sources of measurement error. Discuss proportionality and explain how it applies to transmitters. Discuss the need for linearity in a process. List examples of mechanical and electrical transducer elements. Compare pneumatic response and electrical/electronic response in transducers. Describe the operation of the bourdon tube, bellows, and diaphragm. Name examples of resistance, voltage response, frequency response, and electromechanical devices and explain how they work. Discuss the use of the Hall-effect transducer and the differential transducer. Discuss the basic elements of measuring systems and explain how they interact. Describe how a physical quantity is translated into another quantity. Discuss the use of transmitters to relay information from one location to another and explain the transfer function. Describe the operation of at least five kinds of converters. Compare analog and digital indicators and recorders. Define thermal energy and explain the relationships among thermal energy, heat, and temperature in a substance. Correlate changes in temperature with changes in a substance's physical state. Compare four temperature scales, and convert temperature readings from one scale to another. Explain how primary and secondary temperature calibration standards are used. Describe various temperature-measuring devices and contrast thermometers and pyrometers. Discuss the physical characteristics and operation of bimetallic thermometers. Describe how liquid-in-glass thermometers are constructed and how they operate. Compare liquid-, gas-, and vapor-filled systems and discuss their advantages and disadvantages. Explain how a mercury thermometer operates. Discuss the relationship between temperature and electrical resistance. Describe the function of RTD bridge circuits and explain how to calculate lead-wire errors. Compare the accuracy, response time, stability, and circuit complexity of RTDs and thermistors. Describe the operation of a thermocouple and explain how to compensate for changes in the reference junction temperature. Discuss the principles that govern noncontact thermal measurements. Define electromagnetic radiation and emittance. Discuss the characteristics of a blackbody. Describe the effects of temperature and emittance on radiation intensity. Describe the operation of optical and radiation pyrometers. Compare the three forms of matter. Define pressure and explain the difference between gauge pressure and absolute pressure. Discuss the conditions that affect the pressure of a liquid. Describe how changes in volume affect the pressure of a gas at a constant temperature. Describe how changes in temperature affect the volume of a gas at constant pressure, and the pressure of a gas with a constant volume. Discuss the two causes of pressure drop in a pipe carrying liquid from a tank. Explain how a manometer works. Describe four kinds of bourdon-tube sensors. Discuss construction details of bourdon tubes, diaphragms, and bellows. Explain how bellows pressure sensors work. Describe how calibration may be accomplished and list the steps in calibrating a pressure gauge. Explain how normally open and normally closed pressure switches work. Discuss the advantages and disadvantages of the potentiometric pressure transducer. Explain how a P/I transducer works. Describe the operation of capacitive, reluctive, and servo pressure transducers. Compare the three kinds of strain gauge pressure transducers. Describe the operation and advantages of the piezoelectric pressure transducer. Discuss three environmental conditions that can affect transducer operation. Define the pressure unit torr and calculate pressure in specified units when given the pressure in other units. Explain the operation of a differential-pressure transmitter and a slack-diaphragm gauge. Name two kinds of ionization gauges and describe how they work. Explain how the McLeod gauge works. Compare the operation of the Pirani gauge and the thermocouple gauge. Define datum point, and contrast direct and indirect level measurement. Describe the main kinds of surface-sensing gauges. Define buoyant force and explain how it is used in displacer gauges to measure liquid level. Describe maintenance procedures for float devices, displacer gauges, and sight glasses. Compare the use of sight glasses, mercury level switches, and magnetic reed switches. Differentiate between continuous and point level measurements, and between direct and indirect level measurement. Describe the operation of a conductance probe in a conducting liquid. Describe the operation of a capacitance probe in a dielectric liquid. Explain the operation of ultrasonic, resistance, and photoelectric level sensors. Describe conductance point level probes, capacitance point level probes, and ultrasonic point level detectors. Define hydrostatic pressure and explain how it is calculated by means of the relative density (specific gravity) of a liquid in a tank. Discuss the relationship between pressure head and the location of the pressure (level) indicator. Compare the air bellows and air purge systems and discuss advantages for each. Explain how a force-balance diaphragm system works. Describe the operation of a differential pressure transmitter and explain how it is used to measure level and density. List the data needed to compute the level of a bulk solid in a bin. Describe and compare the operation of wire strain gauges and semiconductor strain gauges. Compare the advantages and disadvantages of ultrasonic and microwave level measuring methods. Discuss the operation of capacitance probes, resistance probes, and bob-and-cable units in measuring bulk solids. Describe how diaphragm switches and tilt switches are used for point level detection in automatic bin fillers. Discuss the use of rotating paddle detectors in controlling level within a band. Explain how radiation level detectors are used for both continuous and point level measurement. Describe the operation of ionization radiation sensors, semiconductor radiation sensors, and scintillation counters. Discuss the operation of an infrared point level detector. Describe several methods of measuring interface levels. Explain how range suppression and range elevation are used. Discuss the important considerations in equipment selection. Explain the difference between density and relative density (specific gravity). Define fluid velocity, viscosity, and volume flow rate. Describe laminar flow and turbulent flow. Explain how static head, friction head, and velocity head differ from each other. Explain how pipe size, pipe friction, and fluid viscosity affect the measurement of fluid flow. Describe direct and indirect flow measurement methods. Describe how a primary device creates a differential pressure. Give at least three examples of common primary devices and explain how each works. Describe the significant features of orifice plates and explain their functions. Discuss the conditions that determine the length of straight pipe required for each kind of primary flowmeter. Explain why both accuracy and precision are required in a secondary measuring device. Describe how an inclined manometer differs from a conventional U-tube manometer. Explain how to calibrate dry and wet manometers. Give examples of secondary measuring devices and explain how they work. Explain how to calibrate a differential pressure transmitter and discuss the different outputs available. Discuss the similarities and differences between rotameters and orifice instruments. Compare the benefits of linear and nonlinear scales and explain how a square-root extractor is used. Explain how calibration, relative density, viscosity, and temperature affect rotameter readings. Describe how changes in the pressure, temperature, and relative density of a gas affect the ability of a rotameter to measure its flow rate. Discuss the operation of piston- and vane-type flowmeters and explain why armored rotameters and orifice-plug flowmeters are used. Describe the advantages and disadvantages of positive-displacement meters. Describe the operation of the reciprocating piston meter and the oscillating piston meter. Describe the operating principles of the sliding-vane rotary meter and the nutating-disk meter. Identify the elements in lobed impeller, oval, and helical flowmeters. Explain the operation of a dry-gas bellows meter. Discuss the calibration of positive-displacement meters. Describe the operating principles governing turbine flowmeters. Discuss the construction of turbine flowmeters. Discuss the advantages and disadvantages of turbine flowmeters. Describe the operating principle governing magnetic flowmeters. Describe significant advantages and disadvantages of magnetic flowmeters. Describe the kinds of controllers most often used in industrial applications. Discuss six important problems of process dynamics that controllers must overcome. Compare the actions of current proportioning, position proportioning, and time proportioning. Name four kinds of controller alarms. Discuss the importance of safety in control loops. Explain why automatic/manual control is necessary. Explain how on/off controllers work and discuss the difference between on/off and proportional controllers. Describe a basic controller tuning process. Describe current-, time-, and position-proportioning controllers and name possible uses for each. Explain how split control works. Describe the effect of the proportional, integral, and derivative modes on a controller's response to process changes. Discuss proper uses for the proportional, integral, and derivative modes. Explain how the proportional, integral, and derivative modes affect the tuning of a controller. Describe the procedure for tuning a controller by the step-change response method. Discuss the function of final control elements in process loops. Explain how an actuator is used with the final control element. Discuss the effect of a disturbance on the performance of a process loop. Describe the three parts of a final control element subsystem. Describe the basic principles of operation for both pneumatic and hydraulic actuators. Discuss the relationships among pressure, temperature, and volume in a pneumatic system. Compare the operation of direct- and reverse-acting actuators. Describe the major components of a simple hydraulic system. Discuss the characteristics of proper hydraulic fluid and describe elements of hydraulic system maintenance. Describe the components of a control valve. Compare the operation and advantages of glove, cage, butterfly, ball, sliding-gate, diaphragm, and split-body valves. Discuss the operation, advantages, and disadvantages, of proportional/servo valves. Explain the differences in linear, quick-opening, and equal-percentage flow characteristics. Discuss mechanical requirements for valves and valve actuator requirements. Explain the relationship of flashing and cavitation to proper control valve selection. Describe the operation of a solenoid with a valve. Name the basic components of dc and ac electric motors and explain how they work. Discuss the advantages of universal motors and stepper motors. Explain how an electromechanical relay works. Name at least three kinds of relays in use today and give typical applications for them. Discuss the applications and advantages of programmable logic controllers.